Today is the official release of the trailer for Jay Legaspi’s first music video, Picture Perfect on www.youtube.com/jaylegaspi. A direct link to the preview can be found here: http://www.youtube.com/watch?v=arpYvNIAnF0. The full music video will be released on Monday, October 25th, also on Jay’s youtube channel. The first single and the title track of the album, Picture Perfect was shot and produced by JR Pena, Angelica Bonus, and Justin Mendoza, better known as The M3 Crew. The treatment for the video was written by Jay Legaspi and Amanda Yu. 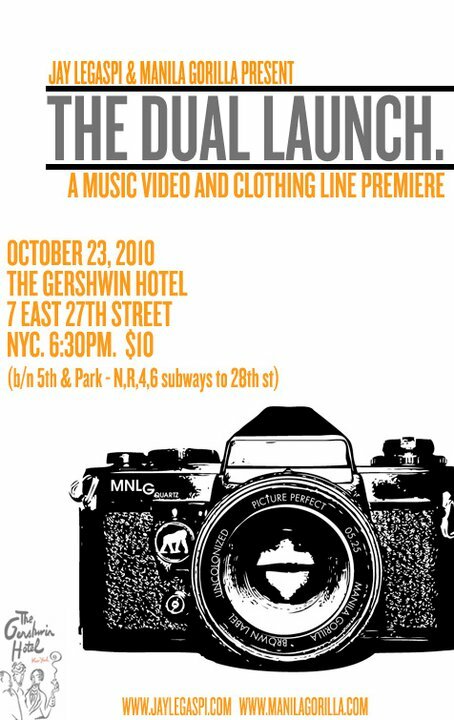 Those in NYC will have a chance to see it early and on the big screen during at “The Dual Launch” event on Saturday, October 23rd. The event is at The Gershwin Hotel in New York City (7 East 27th St., between 5th Ave & Park Ave). Doors open at 6:30 and the premiere will be preceded by a special performance by Jay and his band. Clothing line Manila Gorilla will also be there to highlight select styles from their upcoming clothing lines. Updates and more information will be posted on www.jaylegaspi.com in the following days. Picture Perfect, Jay’s debut full-length album, is available for mail order at http://www.jaylegaspi.com and digitally on iTunes. Jin is back with a new mixtape and a brand new music video for the track “Angels” (which borrows the music track from the Diddy tune of the same name). You can still download the single for FREE here! It gets pretty ridiculous around 2:15 in, then she just kills it at the end… Yeah. Let’s see Miley Cyrus do that. New York — I won’t say that I’m old, but really–I have slowed down a bit. For one thing, I rarely go out mid-week anymore for a gig, let alone for a reading and music showcase. And on any given evening in the dead of winter, the call of my comfy, warm bed has grown more enticing than any night-time jaunt. But about two weeks ago, word filtered through the grapevine (aka, Facebook) that Richard Baluyut was playing a rare solo set. Yes, THE Richard Baluyut, frontman of longtime indie rock legend Versus.